he didn’t have much to say either. Well here I am again, sitting at my laptop again, trying to think of something to say. All of the advice that I have read says just write something and keep writing other things, until inspiration strikes. (Not all but I put it that way for dramatic effect.) I admit I hadn't thought about Morning Pages in relation to dictation software yet it makes perfect sense. I should be able to get up in the morning and the first thing that I do - dictate to the computer in a flow of consciousness. I think I need to reread the morning pages book by Julia , her surname escapes me. [Cameron]. I also need to look up to other things to help me with my workflow. I need to check on how to easily move files from my phone to my laptop, that is Android to Windows 10, to enable the transcription process. Damn, the other what the other thing is has slipped out of my head but I'm sure there were two things I wanted to check on, I think it has something to do with software operation but I will have to check. 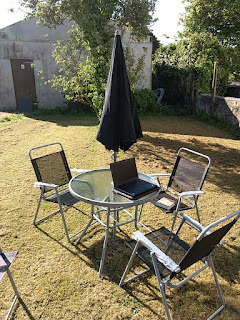 I'm writing this in the draft mode of my Blogger application, Open Life Writer, and it wouldn't normally be something I would post on a blog but writing is writing and if I post things I do like this it helps to keep me honest. My blog isn't a specialist blog, my posts jump about and the only common linking factor is me, so I will post this as a way of tracking development. If I progress this will be just a step in that process and I feel more likely to progress if the things that I dictate/write actually go somewhere. I need to get used to writing for an audience, so the actual act of posting what I write may well help me to tighten up my language. This week we went to the Royal Cornwall Show held at Wadebridge. The Show is an agricultural show that has been running for over 225 years. At one stage the show moved around the county, pitching up each year at a different location, it even came to Antron near Helston once. Once the show settled down at a custom built showground, (by that I mean a group of fields along which they laid concrete tracks and built some permanent sheds), the show has remained pretty much the same. Centred around displays of agricultural equipment and animals, the show also attracts retailers such as garages, clothes and food retailers. Dotted in amongst all of the regular firms that attend are tents full of crafts, by banding together the craftsman can afford the cost of renting space at the show, and some individuals with a particular product to sell. I have to say I did feel a little sadness when I came across a stall being manned by the actor John Challis, where he was selling his autobiography but whenever I passedI didn't see any customers (that's not to say he didn't have loads). I'm not convinced that an agricultural show is the sort of place to attract a lot of readers particularly, a bookshop being a more focused selling opportunity, yet it does afford a very large footfall within a very limited period of time. It may be unfair of me to think of it is sad, I think I am seeing him as an actor selling a book when he is an author promoting his wares. At the show there are displays of crafts and country skills, such as fly-fishing, sheep shearing, gundog displays, and even horse riding competitions.The show hasn't changed much in that a lot of the displays remain in the same spots, every time we go the Flower Tent, the Churches tent, the vintage vehicle section, the Dog Show to name a few, they are in the same locations. The first couple of photos are from the Flower Tent, a combination of commercial nurseries displaying their wares and selling various items, while also competing against each other for certificates for first, second, third et cetera. (They actually refer to the certificates as medals as they do at the Chelsea Flower Show). The tent also has amateur flower arrangers ranging from flower arranging clubs to schoolchildren. There is always a large central themed display by Lifton Farm Shop. This year's theme involved scenes from Peter Rabbit, where fruit and vegetables were arranged in interesting ways.Lifton also sell baked goods as they have their own cafe so have a food focus too. The photo top right is of a group of bonsai trees, cultivated from azaleas, all in flower at the same time- something I've not seen before. The largest of the photos above is from a pitch just along from the Flower Tent where forestry and chainsaw art is created. To the left in the picture is a bench featuring ends with an eagle and, we think, a vulture. On the right in the picture is a hat and coat carved out of wood, varnished by the looks of the sheen, designed to look like they are hanging from a coat hook. The Eagle and bench were made using a chainsaw but I'm unsure as to how they created the hat and coat. Bottom left in the set of photographs is one I took of Prince Charles, although I was not very close when I used my phone camera he can be seen in the middle. Prince Charles and Camilla were attending the show as Prince Charles is the patron. The final photograph is of a handmade chicken coop to illustrate a combination of the agricultural nature and the use of crafts. I hadn't planned to take photographs in order to blog about the show, if I blog about it again I have to remember next year to take some dedicated photos. We caught up with some of our oldest friends, which was something we wanted to do for a long time, had some nice food, saw some interesting things and generally enjoyed the show, though there's always more to see than we manage to get to in a day. If I was asked to name four traditional Cornish foods I would choose the Cornish Pasty, Saffron Cake, Hevva Cake and the Cornish Cream Tea. Today I want to talk about the cream tea. There has been debate as to where the cream tea originated, some say Devon and those who know the truth say Cornwall. a scone - small item of a bread-alike consistency (a sweetened version of the American "biscuit") See this BBC recipe. a portion of Cornish Clotted Cream. Wikipedia’s definition. A Devon or Devonshire cream tea consists of a scone with cream placed upon it and on top of that is jam. In Cornwall we always choose to place jam upon the scone, followed by the clotted cream. In my opinion the only time you would want to put your cream on first is if you are ashamed of it! Here is a link to a long term maker of clotted cream, since 1890, with scientific research carried out to identify the best way to serve a cream tea: Rodda. The photo at the top of this page is somewhat fancier than a standard cream tea, in fact the picture shows a Chocolate Cream Tea (pause, while purists engage in a sharp intake of breath). The cream tea is accompanied by chocolate chip scones and a Canton tea that has chocolate undertones; the plate, in this case slate, was also decorated with a cut strawberry, raspberry, physilis and kiwifruit, along with a fruit like a large blueberry that I couldn't identify. This cream tea is served at the Waymarker, a Cornish food establishment situated between Falmouth, Constantine and Halvasso: set your satnav to find the postcode - TR11 5PW. I have no connection to the Waymarker. I'm just a very happy customer who has been there on quite a few occasions and always enjoyed the food and the very friendly service. I receive no benefit from mentioning the Waymarker. Since installing Dragon Professional individual 14 I've noticed a few things. When I try to dictate into Chrome using the standard entry or the Dictation Box my whole laptop freezes. I don't know whether this is since the Windows 10 1803 update as my laptop had already updated before I installed Dragon Professional. This is not a documented issue at the moment, that I could see from searching on Google. I also had some problems dictating into a Blogger blog page using Microsoft Edge, whereby my laptop also froze. Using the Dictation Box delete didn't solve this until I changed it via the Dictation Box settings, to emulate typing text rather than a paste option; the only problem with the Dictation Box was that it did miss the first four or five words that have been dictated into the box but didn't make it onto the page when I instructed the program to transfer the text. The programme Open Live Write enables me to dictate straight into a Blogger template without the laptop freezing in Windows 10. I started to use an old microphone headset from 2011, seven years ago, that worked well when I first tried it but then refused to work in any of the USB sockets on my laptop. I bought Jabra wired headset that is fairly new and I haven't had any problems since, in fact the boom microphone works a lot better than the shortened one on the old headset. I believe it is false economy to use an old headset with such a modern programme, having to correct things because of the microphone erodes the efficiency of the more modern dictation program. I'm amazed at the accuracy of this dictation program given that I only practised on two paragraphs to set up the microphone and, as long as my diction is clear, I have had virtually no need to correct anything. The majority of things I have altered have been the result of either not thinking about capitalisation before I say a word or the desire to change what I have said once the words have left my mouth. I did install the Dragon extension into Chrome, version 66 point zero point 5 something, but it does not seem to be functioning as I have not been able to carry out verbal commands in Chrome, even though the extension is turned on. It's taken a while to get to the point where I can write blog posts via the Dragon professional program. Setting up the dictation program was the easy part getting to the point where I could dictate a blog post, as I use Google Blogger, was a little more complex. Initially I thought I could dictate straight into a windowing chrome but the computer kept freezing. I don't believe it's a lack of peril on the part of my laptop as it has a sixth generation i5 processor and runs Windows 10. I did try to open the Blogger site with Microsoft Edge in case it was an issue with the chrome browser but I had the same problem with the computer locking up. I then remembered that Word has a blog template but unfortunately that no longer works with Google Blogger so I couldn't attach the blog template to my blog. It took some searching before I found a program that would work, I remembered Windows Live Writer was an option in the past but it had been discontinued in 2016; fortunately, it turned out that Microsoft made an open source version available which was called Open Live Writer. I've installed Open Live Writer and within a few clicks I had set it up to work with my Google Blogger account. I am dictating this blog post to celebrate the fact that I can dictate into a blog template and, if all goes well in a moment, post it to my blog. Eating our tea sat in the garden has always been a favourite experience, even when in ear shot of a rookery. Behind me as I type this is a majestic Monterey Pine that has stood tall far before my birth and growing up here. Also since before I was born there has been a rookery, commanding views over the village and out to sea, likely making it a very desirable location, if not for the noise. I love the sounds of nature, it is one of the abiding joys of driving a Miata, but the dubious pleasure gained from close proximity to a rook call centre is an acquired taste (there are times I question whether I have made the acquisition.). My younger brother built two bench tables some years ago but eventually, as will happen to all of us, time and rot overcame them. My skills have never veered into the path of something as useful as construction, so when it came time for a replacement Cathy and I decided on a very modest purchase. "Oh look who has got pretensions to be a writer! Sat there at his table all writerly like, probably got nothing to say." "He's been out there before you know. Fountain pen and paper last time and where did that get him." 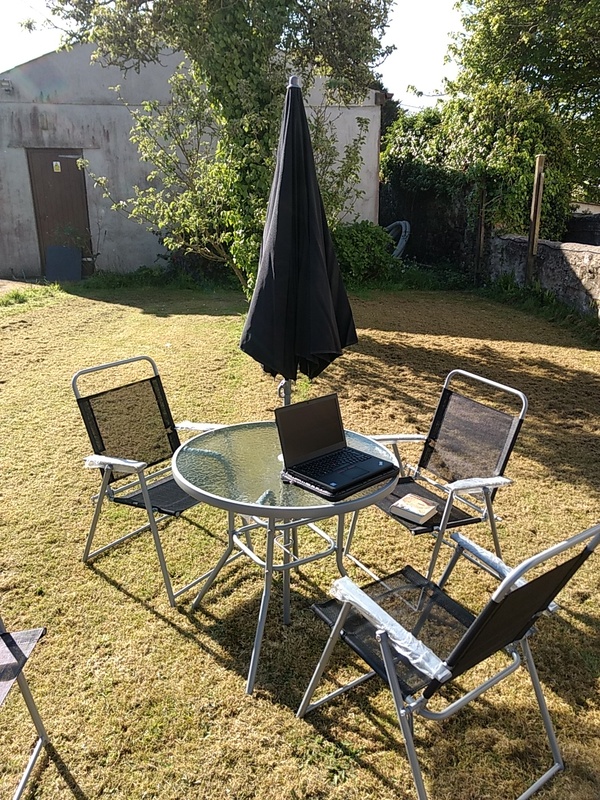 Anyway here is my new working location, weather permitting, as it does currently.